Earlier this month the IETF accepted the Opus audio codec. This might not seem like the most exciting news in the world and, unless you're really keen on technology standards or FOSS, it's not. But you might want to keep an eye on it. A codec is the technology used to store or transmit information (code/decode), and the most famous one is probably MP3. MP3 kick-started the digital music revolution, but almost from the start was dogged by fights over patents and poor encoders. It got improved over the years, but was superseded by Vorbis, AAC and others. The problem with having lots of standards though is that there isn't a standard one and despite its flaws MP3 remains, nearly 20 years after its release, the most widely used codec. In approving Opus the IETF has managed to bring together several big players, including Microsoft and Google, and we can hope that support is going to be widespread. So we'll probably be hearing more of Opus, will it change your life? It might. Opus started in two places - as an improvement to the technology used in Skype (SILK) and as the Xiph foundation's new low-latency music codec CELT (It's partly through the efforts of the Xiph and Mozilla foundations that Opus got the approval of IETF). 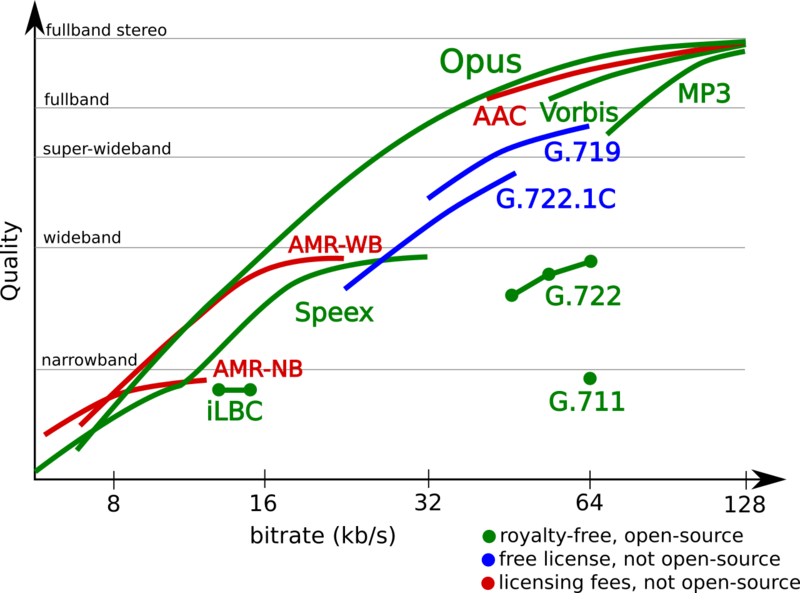 Based on new technologies Opus beats almost every existing codec for quality at the same bitrate. Nice graphs like this are a bit suspect, but it's backed up by testing by several of the organisations involved in creating Opus. At high bitrates though you aren't going to see much difference in quality for music - all the top players are about the same. The real advantage of Opus is low latency. Because audio codecs work in chunks there's a minimum wait-time between sound going in and out. Opus was designed from the start to be really fast and it has a lower latency than any music codec, and that means it can be used for real-time work. In English: Opus can be used for online performance and collaboration. While it's still early days there is already an application called SoundJack based on Opus and even a Virtual Open Mic Night using it (disclaimer/warning, I haven't tried this yet...). Efforts like WebRTC (real-time communications) are going to eventually make it even easier to get connected and jamming. Find out more at www.opus-codec.org. Or, if your browser supports Opus you can try this sample from the Xiph foundation: Bad luck if you don't see play controls here.